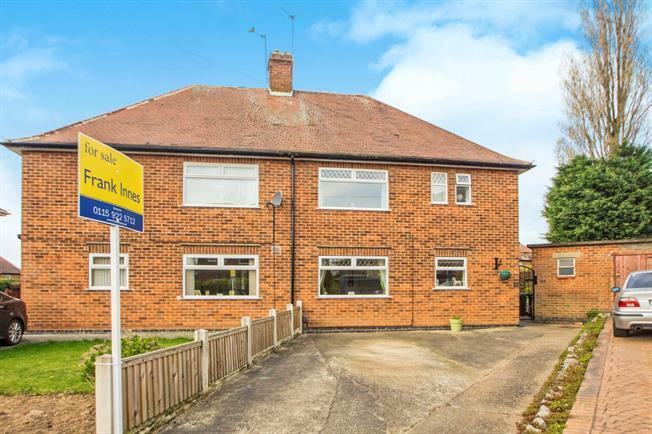 3 Bedroom Semi Detached House For Sale in Nottingham for Offers Over £200,000. Accommodation briefly comprises; Entrance hall with doors leading to the lounge/diner, kitchen and WC. To the first floor are three bedrooms and family bathroom. Outside the property sits on a substantial plot benefiting from a driveway to the front of the property and a very generous sized landscaped private rear and side gardens. No upward chain! Modern range of fitted wall and base units, rolled edge work surfaces and integrated electric oven with gas hob and extractor fan, Space for washing machine and fridge/freezer. UPVC back door and double glazed uPVC window facing the rear overlooking the garden. Spacious lounge/diner with double glazed uPVC windows facing the front and rear, electric fire and two radiators. Downstairs WC with tiled floor and double glazed window to the side. Doors leading to three bedrooms and family bathroom. Double glazed uPVC window facing the side and airing cupboard housing the hot water tank. Double bedroom with double glazed uPVC window facing the rear. Double bedroom with double glazed uPVC window facing the front. Double bedroom with glazed uPVC window facing the rear and radiator. Three piece white suite with tiled walls and floor incorporating low level WC, pedestal sink and panelled bath. Double glazed uPVC window facing the front and heated towel rail. Outside the property sits on a substantial plot benefiting from a driveway to the front of the property and a very generous sized landscaped private rear and side gardens having lawn, patio areas and a mix of shrubs and plants.